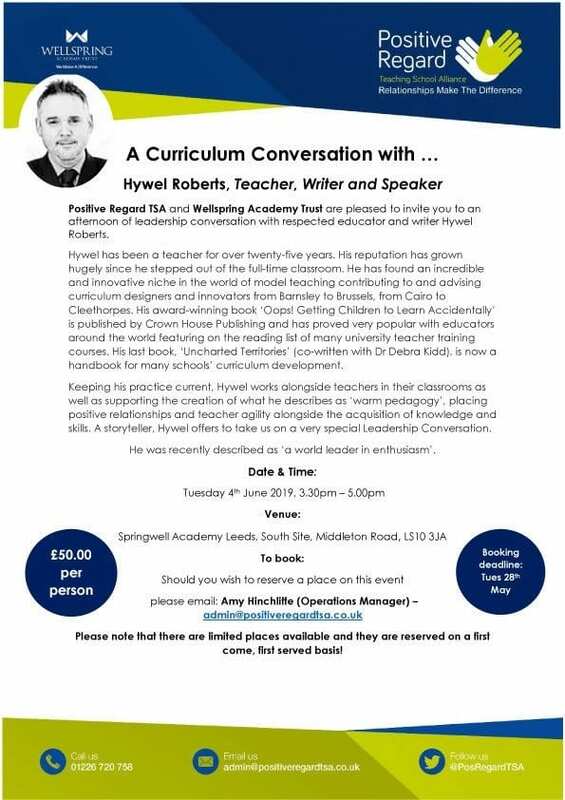 Positive Regard TSA and Wellspring Academy Trust are pleased to invite you to an afternoon of leadership conversation with respected educator and writer Hywel Roberts. Hywel has been a teacher for over twenty-five years. His reputation has grown hugely since he stepped out of the full-time classroom. He has found an incredible and innovative niche in the world of model teaching contributing to and advising curriculum designers and innovators from Barnsley to Brussels, from Cairo to Cleethorpes. His award-winning book ‘Oops! Getting Children to Learn Accidentally’ is published by Crown House Publishing and has proved very popular with educators around the world featuring on the reading list of many university teacher training courses. His last book, ‘Uncharted Territories’ (co-written with Dr Debra Kidd), is now a handbook for many schools’ curriculum development. Keeping his practice current, Hywel works alongside teachers in their classrooms as well as supporting the creation of what he describes as ‘warm pedagogy’, placing positive relationships and teacher agility alongside the acquisition of knowledge and skills. A storyteller, Hywel offers to take us on a very special Leadership Conversation. He was recently described as ‘a world leader in enthusiasm’. Please note that there are limited places available and they are reserved on a first come, first served basis!